First let me apologize for leaving you waiting so long for the post! Life has a way of getting in the way of my good intentions! Also- please pardon the long entry- This was a very eventful day for me and I have a lot to share. As you know, my trip to Peru had started extremely rocky!!! If you want a reminder: (Ended up holding hand of Peruvian on my 1st day in Peru!). This adventure has had a way of surprising me on every corner. The things that I thought would be fine were were proving to be catastrophic. But this was the moment I had been waiting for. I had trained all summer for my time on the river. But like the rest of the trip- things did not go according to plan. But let’s not jump ahead of ourselves. We packed up our suitcases and caught the boat to go across the river, to the island where the rest of the racers were camping. As you may recall from Racing on the Amazon River- Day 1 that we had run into obstacles on day 1 and still had to finish our rafts. Although the day before- it had seemed like we were no where close to being done. The rafts were finished fairly quickly. We ate breakfast on the supply boat. My stomach was still a little upset- so I was careful about what foods I chose to eat. Now it was time to line up and prepare for the race! On my raft We had 2 people from Canada, 1 Peruvian and Me from the United States. Our team captain knew everyone but me prior to the race. But we felt like we knew each other from all of our pre-race communications. This was the moment I had been waiting for. I had been training all summer. I pretty much did nothing but paddle from the moment I heard about this race. Today we would paddle from Nauta to Tamshiyacu 67 KM or 41.632 Miles . We got in our raft and we get lined up to start the race. I was focused. I have competed in Dragon Boating and am experienced at keeping my focus inside the boat. The horn sounds and we are off! We were going at what felt like a very fast pace- but when I have seen video of the start- it really didn’t look that fast. Looks can be deceiving we got ourselves into a good position. I can take no credit for this- I just kept in pace with the Pace that Kate set and let Jose do the steering. As we paddled we would chant “Hut, Hut, Hut” as we paddled along. After the start I was assigned to set the pace. Some of my best moments from this day. Were when Steve (one of my team mates) says to me as we are paddling. “Sarah, you are really in your element!” And Kate our team captain said to me “Sarah, you are a really good paddler and I enjoy paddling with you. I mean that.” Those two statements meant a lot to me. But it is true. I am in my element when paddling- it feeds my soul. I truly am never happier than when I am paddling on the water. It is very meditative as one concentrates on one stroke after another getting a nice clean catch, keeping a good steady pace and staying in time with the other paddlers. After the fast start- I slowed it down to a more manageable pace for the long haul. After all this was not a sprint. I would do some of the drills that we do on outrigger- some power ladders, followed by reach stroke- switching it up to keep us energized. We were going to have to paddle for many hours. That is one of the things about this race- you really have no idea when you are going to get there. You just keep paddling and most importantly keep in time. Steve was really struggling at the beginning of the race- he was getting overheated from the exertion in the hot sun. I tried to be encouraging to him- It was okay if he needed to take a break- but if he paddled- don’t worry about how much water he pulls when he is tired- just focus on staying in time. He rallied back and did great. One of the things that I had been concerned about was the heat. But for me this wasn’t such a problem. We were partially submerged in water which helped keep you cool. And when you started feeling the heat we would ask our teammates to splash us and would dip our hats in the water and pour it over our heads. This worked great. What a relief! I tried not to think about all of the scary things that could be in the water. And actually, most of the time I wasn’t worried about that while on the raft. Don’t get me wrong- I was on the lookout the entire time for a Caiman or Anaconda that might want to eat me! Another one of my favorite times on the raft was when Jose who doesn’t speak much English teased me and yelled out to me “Sarah! Anacondas!” I quickly looked and then started laughing- because I knew he was making it up! We had seen no sign of anything scary while rafting. We did see dolphins though. Another concern of mine going into the race was dehydration. I was determined to not get dehydrated while on this trip. I did not envy the thought of being hospitalized or worse. I made sure to keep sipping my water with electrolytes constantly. When we had been in Iquitos and we were not exercising I was drinking 4 liters of water with electrolytes per day. I was determined I would not get dehydrated. I was trying to keep this up. I did a good job of continuing to sip water very frequently throughout the day. Unfortunately, on the raft building day- I had not been able to drink as much water as I needed. So, I was going on day 2 of not feeling good. Once you get behind- it’s hard to recover fully especially in that heat. As we paddled we would sometimes sing songs. We found that the Ant’s Go Marching worked very good. We tried a few others- but they didn’t have the right rhythm for paddling. It was a nice change of pace from the “hut’s” and I had also switched it up by adding counting sets out loud- sometimes in English and sometimes in Spanish. I would need assistance in the counting in Spanish as I don’t speak it. I could tell that Jose found it amusing as I tried to learn how to count in Spanish. It was probably a good thing no one could hear us singing. Although I am good at leading songs from my many years of being a camp counselor. I cannot carry a tune to save my life. Maybe that is why we didn’t see any Caiman or Anacondas! Another one of my concerns was my hips. I have an injured S.I. Joint on my hip and do not have full range of motion. Plus my hamstrings are extremely tight. I knew all along that I needed to be propped up. I hap planned for this as best I could. I found a Thick waterproof pad that is used for people in wheelchairs to sit on on the stadium chair that I was using as my seat. My teammates called it the Princess Seat. But let me tell you….I did not have bruises or sores on my rear like some of the rest of my team. But I was really struggling as expected from the position that I needed to sit in for hour upon hour. After about 2 hours of paddling my hips were absolutely killing me. I had to shift position frequently. Constantly trying to figure out how to do this without injuring my hip further. Keeping your energy up for all those hours requires some food. The first thing I ate were some gummy bears. That worked great for me. They were easy to digest and they didn’t seem too heavy on the stomach. They gave me the quick energy i needed while exercising. After a few hours I decided to try eating a bite of my protein bar. I was Strongly encouraged just to very quickly eat the whole thing. Although I tried, I couldn’t do this and ended up having to spit some of it into the water. I knew better and should have listened to my own judgement- no one knows your own body better than yourself. If ever you do this race- or really any other endurance event- know what works for you. All people have different bodies- and they all respond differently to things. This was the beginning of what was the turning point in this race for me. After attempting to eat the protein bar. I got indigestion- so I needed to take some Pepto Bismol. Which luckily I brought along on the raft in my dry bag- just in case. It helped but I don’t think I ever fully recovered from that. Then as I was trying to continue to paddle with the excruciating pain in my hips I just kept trying different positions to see what worked. I tried kneeling and paddling that way a bit. That really did help my hips it made me get Motion Sickness. And once you have motion sickness it is hard to feel better until you hit shore. I was miserable. I started to cry as I tried to just keep paddling. But I was really scared. The seizures I had in Lima that were caused by my motion sickness were awful. I just wanted to get to shore. As I paddled that last hour feeling so incredibly nauseous. I kept thinking of my daughter who fought Cancer for 3 years and she had to live in an almost permanent state of nausea as she underwent Chemo. I kept saying to myself if Kelly could do it for 3 years- surely I could do it for 3 days. But then I was also hearing those voices in my head of people who warned me, as I set out on this adventure- to be smart and to remember that staying alive was more important than finishing the race. As I paddled unsure if I was going to have a seizure or not. I thought about how safe it would be for me to be in that position. I realized that if I layed down on the raft like- I would if I was going to have a seizure- likely I would get water in my mouth and drown- that’s if I managed to stay on the raft. I was struggling with this and coming to the realization that I didn’t want to risk my life. I know that my daughter needs me and I was really struggling with the fact that I didn’t want to let my team down. But I knew that completing the race was not what I wanted to do. I kept saying to myself-why couldn’t this race only be a one day event??? As all of this is going on and I am quietly sobbing. Kate tells us to paddle strong around the corner and then she says quietly to me. “Sarah we are at the finish for the day. You did it!” I was so incredibly happy! There were all these beautiful white birds along the river leading the way to the finish line (of day 1). I pretended that they were my welcoming committee! But we actually did have a Welcoming Committee as we arrived there were all these little kids from the little village there waiting for us to arrive and they looked at us like we were there Hero’s. They were incredibly cute. After we landed I remember hugging Kate and crying tears of joy and relief. I could not believe that we were already there. I thought we had about 4 more hours left to go. So it was shocking to be done already for the day! We were the 1st international boat to arrive. We were shocked to discover that were ahead of both of the other teams in our group. As the final racers were making there way in- it began to start pouring rain and lightning. It just added to my misery. I now had full fledged diarrhea by this point and was monitoring it to see if I was getting Travelers Diarrhea or if it was getting severe enough that I needed to take the antibiotics that I had been prescribed for such an occasion. At this point- I didn’t think it was bad enough. It was a very chaotic evening. The supply boat could not get to shore where we finished the race due to the extremely low water conditions this year. We needed the supply boat to bring us dinner and our gear. So all the racers had to get shuttled over with our Camera Crew’s boat to eat dinner and then to later to a new spot where we would camp for the night. I flew to a country to race in the World’s Longest Raft Race with a group of people I had never met before. I Spent a couple of days traveling on my own in a country that I don’t speak the language. I did eat a Grub. 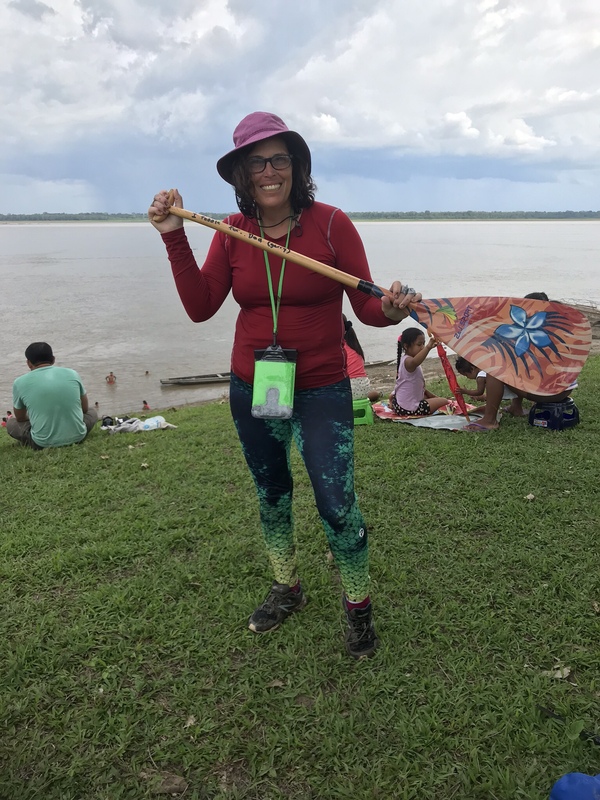 I did paddle 67 KM in the Amazon River in a raft that I helped build (slightly). Most people wouldn’t even attempt this. I am proud of what I did. I am a strong paddler- My arms were not sore even in the slightest after racing. I was trained and I know how to use my full body when paddling. But what did hurt was my hips. I found myself hobbling around for much of the rest of the trip. I have been back from Peru for 24 days now and I can tell you my hips still hurt. Even though it literally breaks my heart that I was not able to complete this race. It was probably a blessing. I suspect I would have injured my hip or back severely attempting it. I would have pushed through that kind of pain. But Seizures – the risk of them was too much for me. Had I not had the problem in Lima- I may have Been able to finish the race. But my confidence was shot and I was scared. At this point, I felt like the trip that I was taking to help build my self confidence was slowly destroying me. Honestly, I think part of the reason I was not able to Blog for a bit was the fact that I needed more time to process everything. I am still struggling with the disappointment from this trip. But I am proud of what I did accomplish. I had to make a very difficult decision. And with all important decisions-it is easy to second guess oneself. I wonder if I made the right decision, But it is the one I made- so I have to go with that. But I think there is a part of me that will regret not attempting to finish the race for the rest of my life. Previous Amazon Raft Race- Day 1- Building a raft! What a tale to tell and memories for a lifetime. No regrets! I like your focus on the accomplishments. As the old adage- it is better to have tried than to not have tried at all.